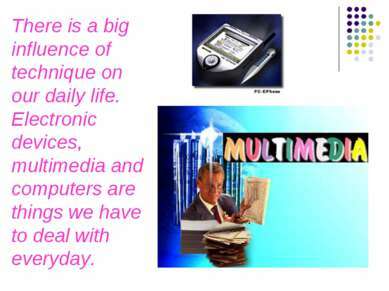 There is a big influence of technique on our daily life. Electronic devices, multimedia and computers are things we have to deal with everyday. 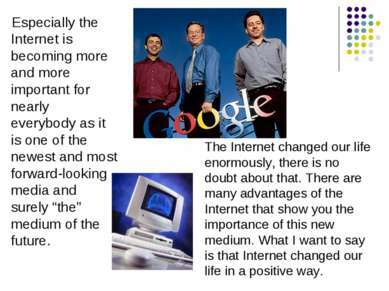 Especially the Internet is becoming more and more important for nearly everybody as it is one of the newest and most forward-looking media and surely “the” medium of the future. The Internet changed our life enormously, there is no doubt about that. 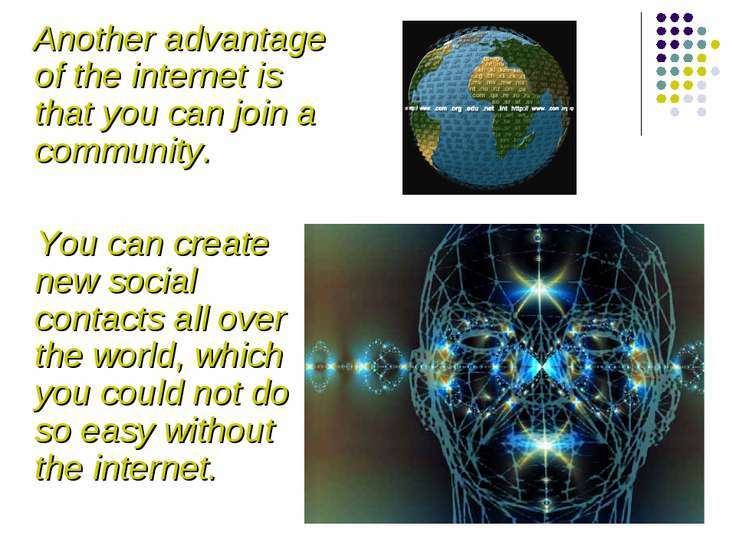 There are many advantages of the Internet that show you the importance of this new medium. What I want to say is that Internet changed our life in a positive way. 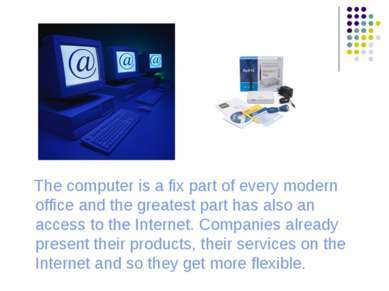 The computer is a fix part of every modern office and the greatest part has also an access to the Internet. Companies already present their products, their services on the Internet and so they get more flexible. 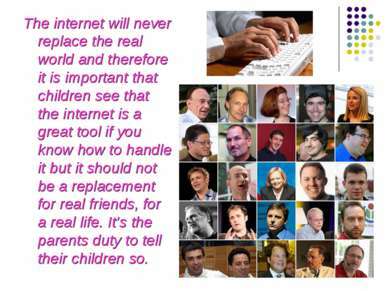 Another advantage of the internet is that you can join a community. 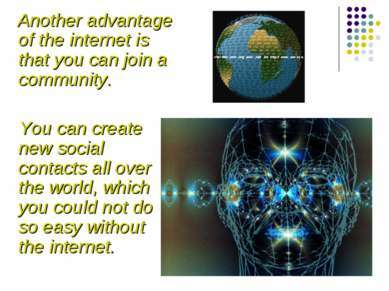 You can create new social contacts all over the world, which you could not do so easy without the internet. 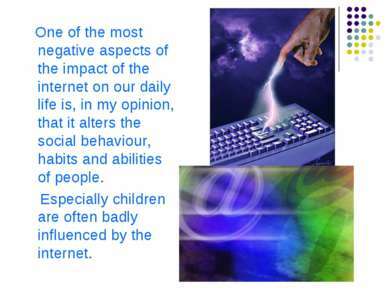 One of the most negative aspects of the impact of the internet on our daily life is, in my opinion, that it alters the social behaviour, habits and abilities of people. Especially children are often badly influenced by the internet. The internet will never replace the real world and therefore it is important that children see that the internet is a great tool if you know how to handle it but it should not be a replacement for real friends, for a real life. It’s the parents duty to tell their children so. 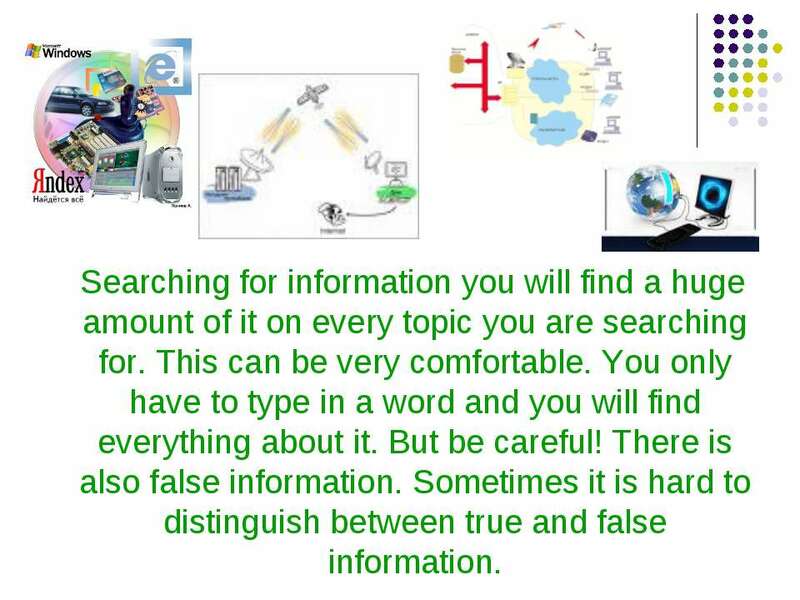 Searching for information you will find a huge amount of it on every topic you are searching for. This can be very comfortable. You only have to type in a word and you will find everything about it. But be careful! There is also false information. 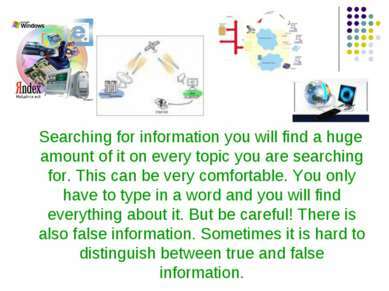 Sometimes it is hard to distinguish between true and false information. Often you have the possibility to listen to music on the internet. You may also download it for free. That is very cheap because you only have to pay the telephone-costs and the music is for free. What does that mean for the musicians? They will not get all their money they would normally receive. 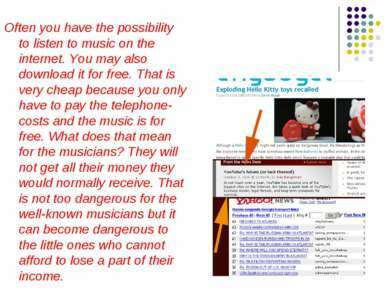 That is not too dangerous for the well-known musicians but it can become dangerous to the little ones who cannot afford to lose a part of their income. Which are the points we have agreed on? 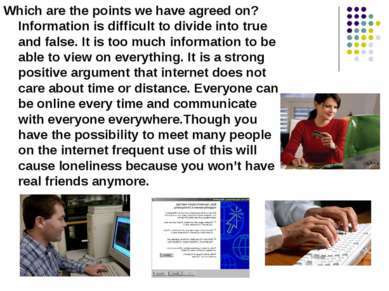 Information is difficult to divide into true and false. 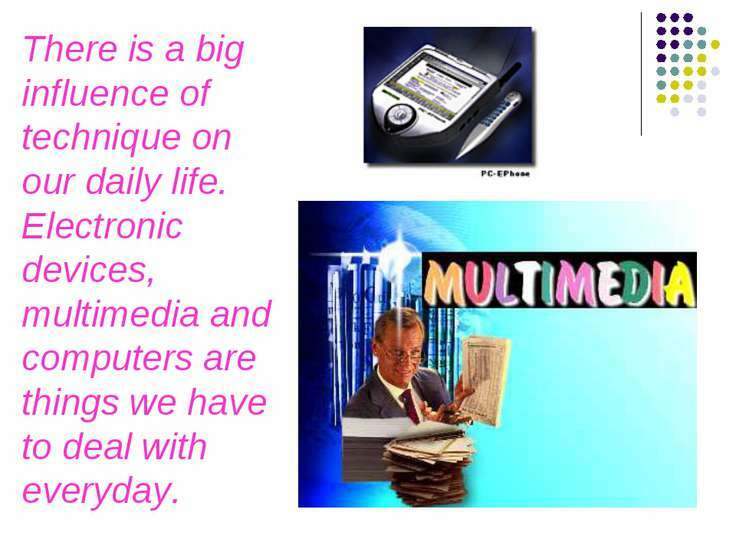 It is too much information to be able to view on everything. It is a strong positive argument that internet does not care about time or distance. Everyone can be online every time and communicate with everyone everywhere.Though you have the possibility to meet many people on the internet frequent use of this will cause loneliness because you won’t have real friends anymore. 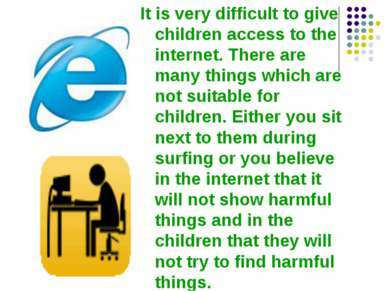 It is very difficult to give children access to the internet. There are many things which are not suitable for children. Either you sit next to them during surfing or you believe in the internet that it will not show harmful things and in the children that they will not try to find harmful things.